The Sony E18-105mm f/4 G OSS Lens is ideal for general purpose, everyday shooting, covering a 5.8x zoom range from 18-105mm (27-157.5mm full-frame equivalent). Its electrically-driven zoom ensures smooth, silent operation for capturing both stills and movies and built-in Optical SteadyShot reduces camera shake during handheld shooting in low-light conditions. 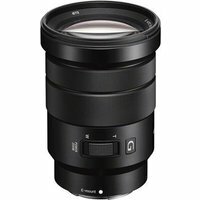 G lenses are Sony's professional quality lenses offering excellent image and build quality.